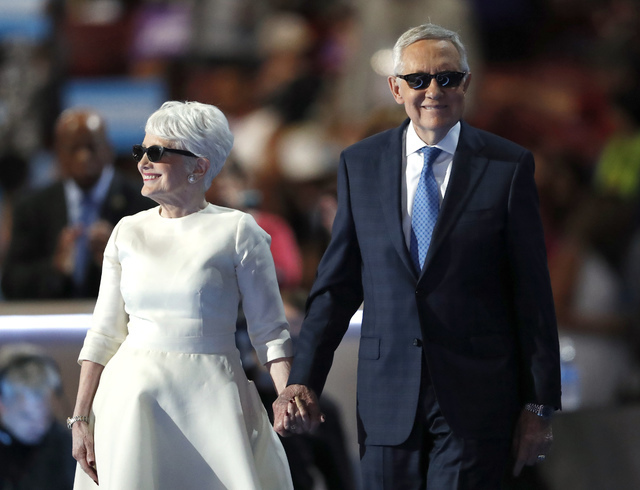 U.S. Senate Minority Leader Harry Reid of Nevada stepped onto the national stage one more time Wednesday, ready for a fight. PHILADELPHIA — U.S. Senate Minority Leader Harry Reid stepped onto the national stage one more time Wednesday, ready for a fight. 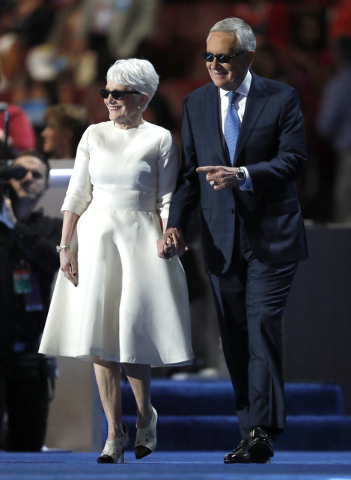 The Nevada political powerbroker spoke at the Democratic National Convention as his decades-long Senate career is winding down. He leaves office when his fifth six-year term ends in January. 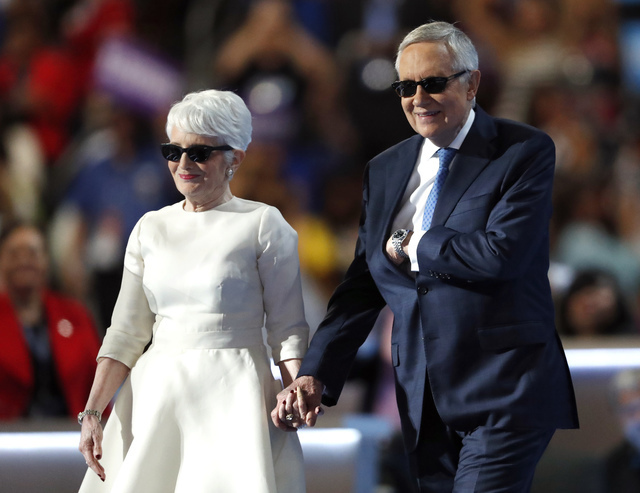 A tribute video played, offering recollections of his Senate career and life with memories shared by his Washington colleagues, his wife, Landra Reid, and President Barack Obama, who said Reid has had a good run. Cries of “Harry, Harry” rang through the arena as he and Landra came on stage. But Reid wasn’t in Philadelphia to reminisce. The senator, who backed then-U.S. Sen. Obama when he first ran for president in 2008, is supporting Hillary Clinton for president. Reid wants Democrats to regain the majority in the U.S. Senate as Republicans eye his open seat as one that could go in the GOP column in November. A politician known for his colorful way with words, Reid took aim at Senate Majority Leader Mitch McConnell, R-Ky., and the Republican presidential nominee, Donald Trump, saying Republicans have stoked fear of Muslims and sowed hatred of Latinos, along with waging a war against women. “In other words, the only thing Republicans like Mitch McConnell have accomplished is setting the stage for a hateful con man, Donald Trump,” Reid said. Reid has been a mainstay in Washington since 1982 when he was elected to the House of Representatives. After serving two 2-year terms in the House, he was elected to the Senate in 1986. Reid rose to power in the Senate, becoming the minority leader in 2005 and the majority leader in 2007. He held that position, considered one of the most powerful in the nation, until after the 2014 election. That’s when Republicans gained control of the Senate and he became minority leader. He’s trying to bring his party back to majority status. “With Hillary in the White House and a majority in the Senate, Democrats will keep fighting for immigration reform that keeps America true; clean energy that keeps America strong; and a Supreme Court that keeps America just; and background checks for gun buyers and an assault-weapons ban that keeps America safe,” Reid said. 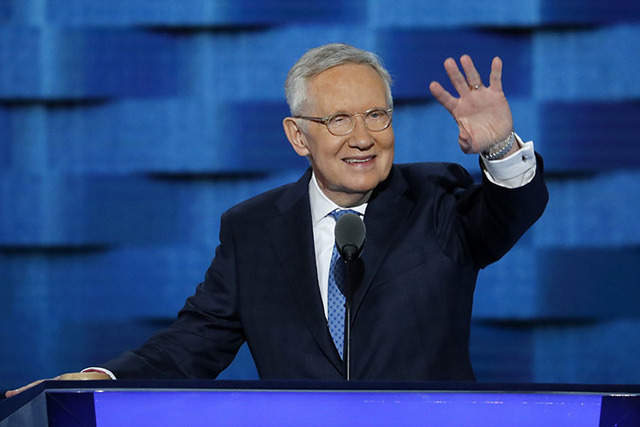 In Nevada, Reid showed an ability to adapt to changing times, survive against tough odds and overcome setbacks. In 1974, he lost a U.S. Senate race to Republican Paul Laxalt by 611 votes. The next year, he lost an election bid for Las Vegas mayor. He became chairman of the Nevada Gaming Commission in the 1970s, a period when casinos were cleansed of organized-crime influence. Reid reminded delegates he was a boxer as a young man. 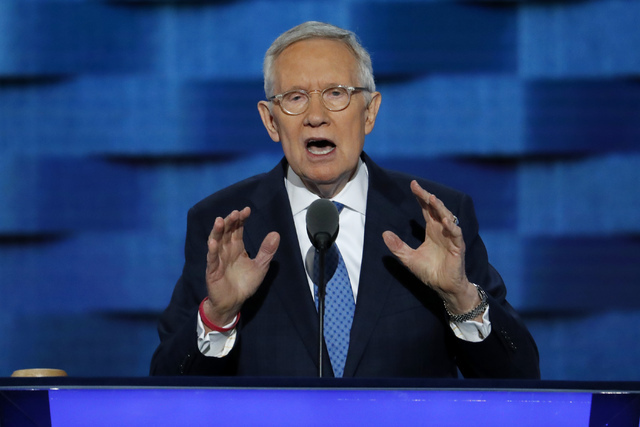 For Nevada delegates, Reid’s departure will be a loss. Araujo, a Nevada delegate, started as an intern and eventually became a regional representative working on housing issues with constituents as the Great Recession hit Nevada’s housing market hard. Reid’s Nevada roots are deep. He grew up in Searchlight, a small town south of Las Vegas. In the tribute video, Reid talked about his life lessons, such as when he earned enough money to get his mother a set of teeth from a job at a service station. “He loved where he came from and he never forgot where he came from,” said Nevada delegate Chris Giunchigliani, also a Clark County commissioner. Nevadans will pick a successor to Reid in November. He is backing Democratic candidate Catherine Cortez Masto, a former Nevada attorney general. She faces U.S. Rep. Joe Heck, R-Nev.